For years, the competitive shooting world was dominated by the 1911. While many competitive shooters owned Glocks, carried them and occasionally shot them at small matches, everybody knew that if you wanted to actually win, you had to get rid of your Glock. And then came Dave Sevigny. Sevigny has beaten everybody who is anybody in the competitive shooting world, and he's done it using the original piece of combat Tupperware. Not only has he won more than 15 world and national titles competing against other Glock shooters, using a Glock 35 he has won the USPSA National Pistol Limited Division Championship going against the best in the world, all of them shooting ultra-custom high-capacity 1911s. In his youth, Sevigny played a lot of competitive hockey and credits that with developing his incredible hand-eye coordination and reflexes. A general interest in guns and the ability to protect himself led him to competitive shooting. Now a sponsored shooter for Glock, Sevigny has traveled around the world teaching and competing. "Dry fire as much as you can," Sevigny says when asked how best to practice. "This includes draws, reloads and presentations to the target. Dry-firing is very important, especially when you are new to pistol shooting." When he first became serious about competitive shooting, Sevigny would spend about eight hours a week practicing and shoot between 20,000 and 25,000 rounds per year. "These days it's about twice as many," he says. "I'm not perfect, but Il always try to be. I'll work hard so my delivery is better next time if I make a mistake anywhere." Sevigny is a big fan of competitive shooting when it comes to training for self-defense situations. 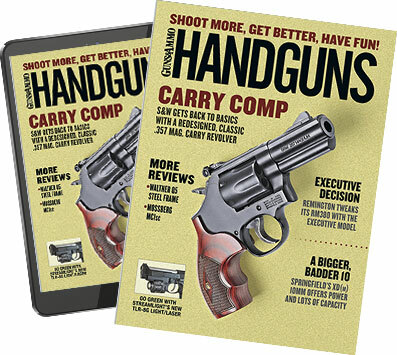 "In practical events especially, competition teaches you to handle firearms safely under pressure while performing tasks such as locating your targets behind objects downrange, making accurate shots at changing distances, performing non-shooting related tasks within a course of fire (opening doors, exiting vehicles, etc. ), tracking moving targets, shooting and moving, and reloading the pistol under the pressure of the clock. It forces you to hustle and do things at a faster pace than a casual static range absent of any sense of urgency ever will." Which type of competition is best for the beginning shooter? Sevigny thinks they all have something to offer. "I began competing in the Glock Shooting Sports Foundation. In GSSF you have to be both fast and accurate, but the premium is on accuracy. Once you have some time behind the pistol and learn what you need to see in order to make the shot, things will begin happening at a faster pace. "I moved to practical shooting in IDPA and USPSA afterwards," he says, adding that he thinks USPSA's version of practical pistol shooting has the best balance of speed and accuracy. Some critics of competition as a training tool have voiced numerous complaints about the "bad habits" it teaches. Sevigny's response to that opinion is polite but direct: "Such critics probably have never competed in anything before and need to be enlightened." Sevigny has spent a lot of time training police officers, most of whom are amazed at what he can do with a pistol identical to the ones they're wearing on their duty belts, and it encourages them. "Some police officers I teach are in their developmental stages, and others have potential to be above-average shooters. The ones who compete with their pistols are always the best from what I have seen. Making C-class in USPSA would be a fair expectation for anyone serious about carrying a gun for self-defense."